We woke early on July, the Fourth, to drive to the Mount Massive Trailhead. Our organizational skills were much improved and we were hiking at 0530. 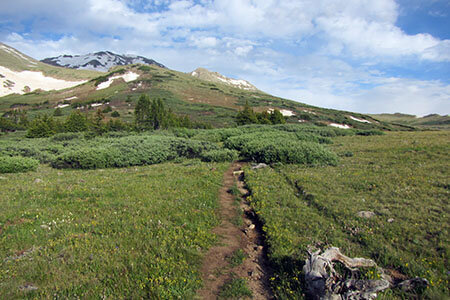 The route begins on the Colorado Trail and follows it north from the Mount Massive Trailhead for 3.25 miles. After the initial climb, the trail rolls along through a wonderful forest of aspen. At a junction we noticed the signifcance of hiking part of the Colorado Trail, it was National Forest Trail Number 1776. How appropriate for a Fourth of July hike! At the intersection with the Massive Trail we turned and started climbing the mountain. 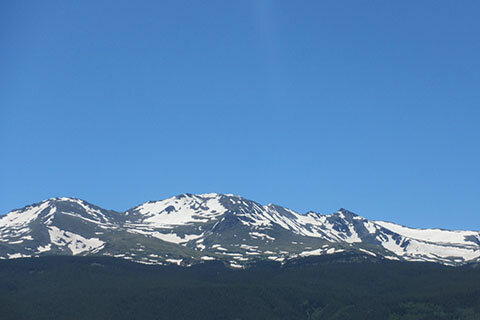 We had hiked Elbert a couple of days before and were expecting the same kind of elevation gain needed to reach treeline, but on Massive the trail was not nearly as difficult. Now, don't forget the trail is still to the summit of a 14,000+ foot mountain and is a climb, but the trail did not have a memorable steep section. Above treeline, the trail had been rerouted to include passage through the willows. 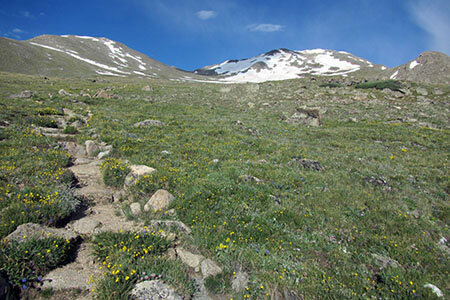 A few switchbacks later, we entered the true alpine tundra with great views in every direction. 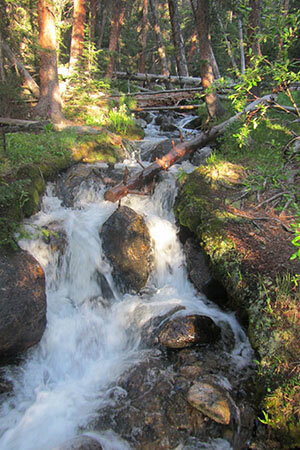 The trail climbed around a shoulder and into the large upper basin. Massive, the large snow covered peak (to the right), looked intimidating, but the trail followed the path of least resistance all the way to the south ridge. Along the way, the views got even better and the wildflowers were in full bloom. As we approached the ridge the route became rockier and steeper than the path so far. 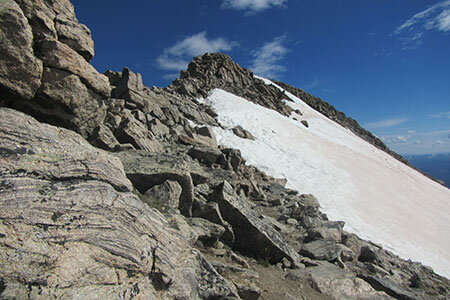 At the saddle, cairns (rock piles) marked the passage along the rocky South Ridge. The route along the ridge required that we used our hands, but there was no real exposure. There was one 100 feet (or so) lingering snowfield. It was an easy crossing using treking poles. The summit was crowded so we did not stay long. The route down was filled with encounters with hikers still on the climb up. They wanted to know about snow conditions, how far (? ), and the weather. It was fun talking to each group. Back on the Colorado Trail we walked at a a fast pace and were back at the trailhead by 1330 (one-thirty). One person in the parking area asked when we left to be down at that time. Another person was from Omaha and was a newcomer to the 14er scene, but was game and full of good conversation. He was going to climb Elbert the next day. It was a good day for us and much easier than our day on Elbert, but with similar mileage. Of course we are still getting older by the day, so we will have to wait until tomorrow to find out just how massive of a day it was.